- Capacity: 12" to 48" Inner chamber. - Made of Stainless Steel and Mild Steel. 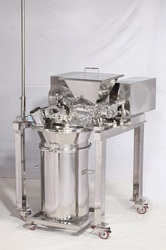 We are Leading Manufacturer of Turmeric Pulveriser Machine. We are offering wide range of Grinder Machine for FOOD Industry. These are available in various models depending upon production capacity & hp required. Mini Micro Pulveriser Machine is used in all kind of prodcuts like, Food (spices), Colors, Dye, Pigments, Chemicals, Wood, Minerals Etc. Mini Micro machine is useful to get lower output at lover cost of investment. Owing to the rich industrial experience and expertise in this business, we are involved in providing a supreme quality array of Micro Pulverizer Machine. 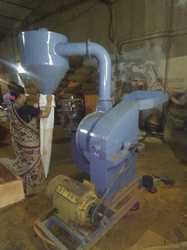 We are dealing in Industrial Micro Pulverizer. - In order to keep pace with the never ending demands of customers, we are involved into offering wide range of Industrial Micro Pulverizer. - Design provides for admitting extra air during grinding to facilitate cool operation. ( Micro Pulverizer ) is used in Herbal Extraction Plant, Solvent Extraction Plant and Pharmaceutical Plants, to make powder of different material. Raw material feed in rotary feeder from inlet hopper and spills into the grinding chamber. Strong hammering breaks lumps into real small particles.